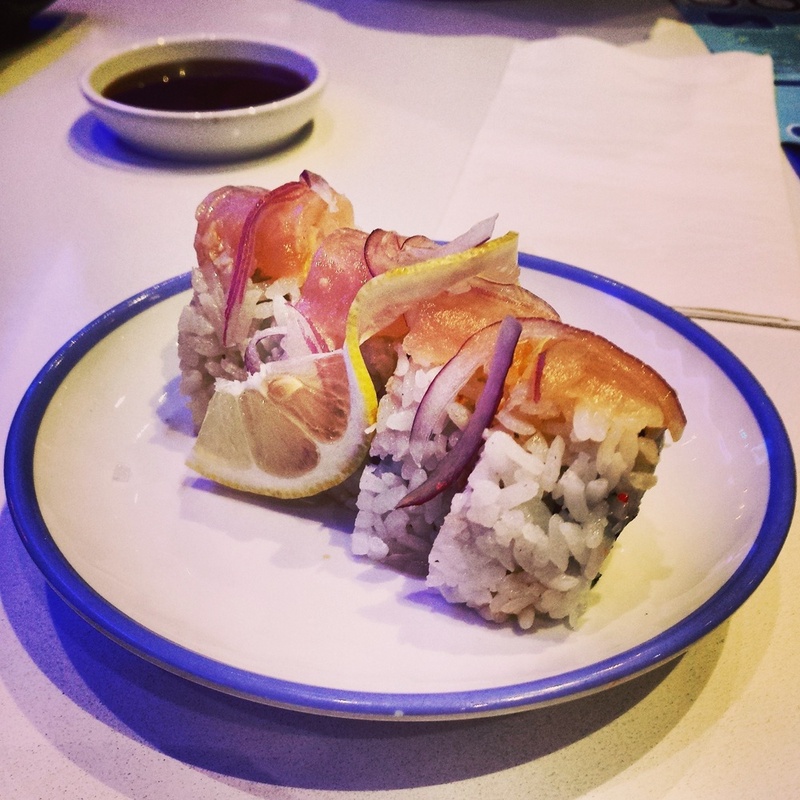 Pardon Punctuation...When I think sushi on a conveyor belt I think crappy sushi…well Blue C Sushi in Hollywood has changed that for me and elevated the quick sushi experience. How? Well first off they use fresh fish and secondly they offer the quick pre Arclight movie dinner option or the longer..drink my whole bottle of sake at a sushi restaurant experience. The dining room is pleasant, vibrant, and colorful. Servers are friendly and knowledgeable and will guide you through the experience when you need it and leave you alone when you don’t. Ordering is as easy as picking a dish based on the color of the plate. As each dish comes around on the belt you know exactly how much it costs and what it looks like before you eat it. Glutton free options are clearly stated on the menu and they are plenty of options for those of you with dietary restrictions. They even have fairly priced sake flights for the novice to the most experienced sake enthusiast. All good stuff. Here are my highlights. Sake Flight: The perfect way to start any sushi dinner. They offer you options at different price points so both the expert and novice can enjoy sake the way they like it. Loaded Bake Potato: Japanese potato salad gunkan, topped with bacon, cheddar, sour cream, chives, bonito, and caviar. What a fun spin on a traditional American dish. This is a "must order" if you go. Fun, innovative, and a great way to start the meal. Spicy Tuna on Crispy Rice: This is a dish that has been imitated over and over again. The interpretation they give you at Blue C is delicious and perfect. The habanero masago is a nice touch. Tuna BLT Roll: As far as I'm concerned you could probably wrap a cat turd in bacon and it could probably taste good. This was a killer roll and something I've never had. Saw it on the conveyor belt and I had to have it. Perfect for a quick roll pre movie theater. Live Scallop. The best part of the whole meal. Fresh, fresh, fresh and some more fresh. Served on a bed of ice. WOW! Gluten Free Chocolate Chip Cookie: I've had my share of gluten free baked goods that taste like dust. This cookie good. Even tasty for the non gluten free crowd. Tempura Brownie: The name says it all. Battered and deep fried. It was a little heavy for me but still tasty and served a la mode. If you're heading to the Arclight or not, this place is putting out some rocking sushi at a fair price. You don't have to be in a hurry but if you are Blue C Sushi knows how to take care of you.